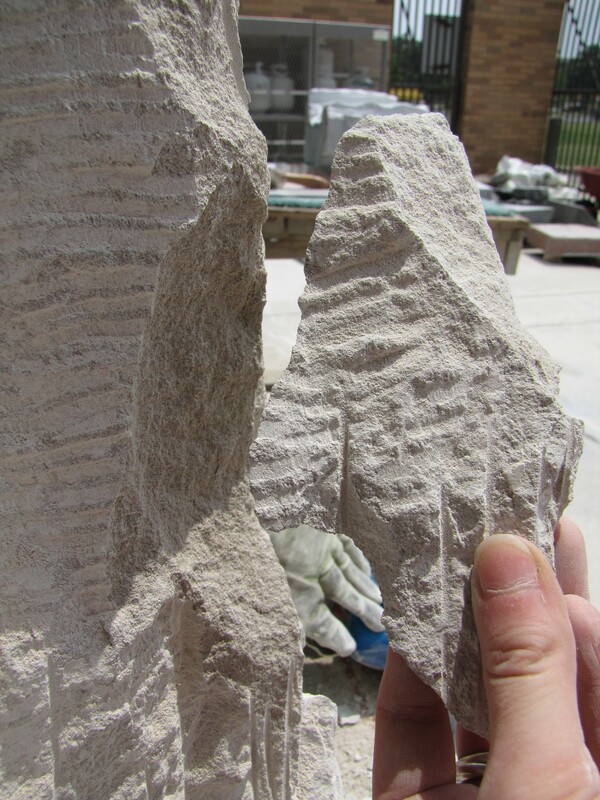 I mean, you spend months – or longer – working on a sculpture and it could be ruined in one misplaced strike of a chisel! It can give a person pause before swinging the hammer, let alone using a pneumatic or an angle grinder that removes material with far greater speed and force. I’ve spent a good amount of time staring at my rock, deciding where and how much to take off with a deliberation that can border on obsessive. Luckily, it was only a baby-cleave. And after assessing the whole design, the material would have had to come off anyway. Phew! But I definitely stopped and stared at the missing divot in my sculpture for a good few minutes before continuing. If more material had cleaved I probably would have first stared in silence for an hour, then crawled into the corner with Michelangelo (in the alternate universe where he maimed the statue of David). Then I would take the rest of the day off. And finally, after the grief subsided, I would redesign my piece to accommodate the new shape of my stone. 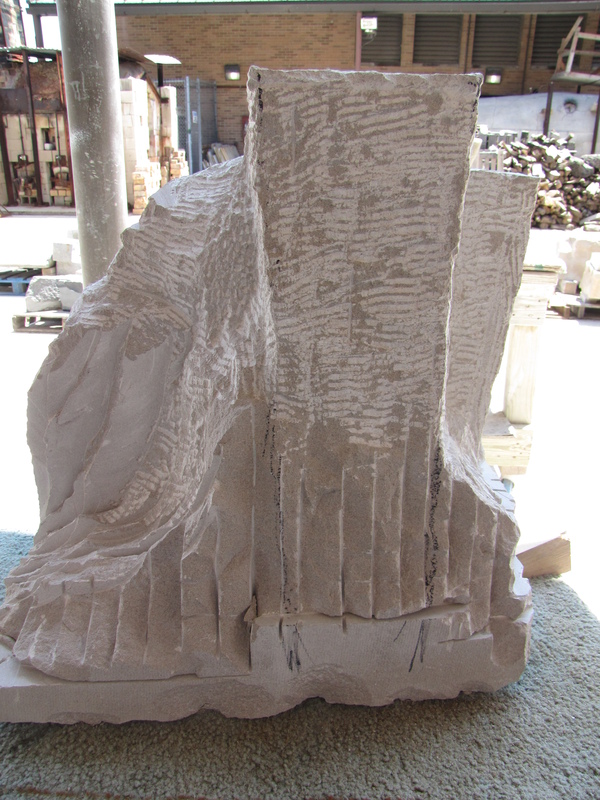 That’s all my fear of chiseling a sculpture to bits is, after all, a fear of not realizing the vision for the sculpture exactly as it appears in my head. I think a lot of artsy types have this issue. We want to touch the shape in our minds, make it real and say, “See? That’s what I’ve been trying to describe to you all this time!” So when the materials (or our current skills) don’t match up to the idea, it’s disappointing. My teacher reminds us that we always need to take off more material than we think. I have a feeling this is because we’re afraid to take off too much. Chunks aren’t easily put back once they’re removed. Glue can work in a pinch, but not in every situation. So we obsess and shave off little bits at a time, making a long process take even longer. When I’m too hesitant the teacher offers to let other students chisel at the piece. They’re not afraid. It’s not their baby! So they can take the risks more easily. Sometimes, stone requires a certain amount of bravery. It takes so long to carve, there’s no thought of starting over if something accidentally breaks off – so one chance is all you get! I’ve decided to adopt the philosophy of rolling with the punches when it comes to carving. It can always still work out, just differently. Maybe better. (Maybe not, but there will never be any proof!) So I might as well assume that all accidents are always for the better and amend my design to whatever happens. 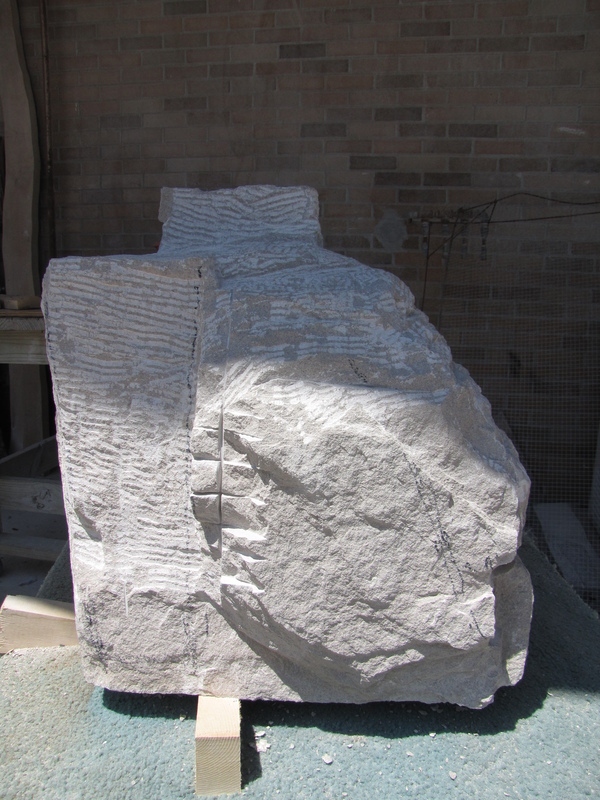 Then there’s no reason to be afraid of taking off too much stone to find my sculpture! So far, here’s the progress. The lines mean I’ve started in with the pneumatic hammer which does speed things up considerably! Check out where this project started here!